Stay up to date with L.I.F.E. 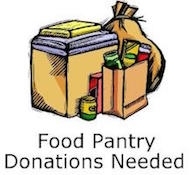 needs through our weekly wishlist, click on the link below to the Pantry Weekly Wishlist delivered directly to your email. Feed the Hungry Challenge—help us reach our goal of $35,000 in $$ and products! Sweetener--Equal, Sweet n' Low, etc. March 1st begins our Feed the Hungry Challenge--help us reach our goal! Rain, rain, go away--but until it does, let's share some warmth to take the chill away! Potato side dishes--au gratin, scalloped, julienne, etc. Happy New Year! Hunger never takes a break—please think of us as you begin 2019 and thank you for your continued support. Our blessings overflow and we are grateful. Shelf stable cheese—Velveeta, Parmesan, etc. If you are able to drop items during Pantry hours (M/Th 4-6:30, W/Sat 10-12:30) our clients LOVE fresh/frozen items!